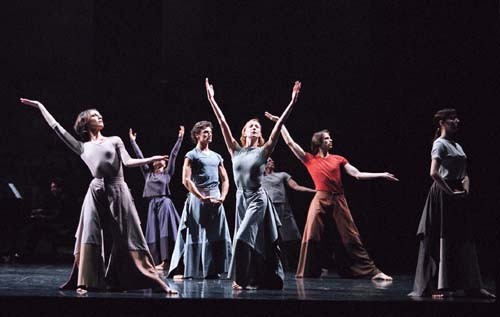 PARIS, 3 March 2005While the idea of programming three European choreographers, all women, might have seemed attractive, the results were far from wonderful. At a press conference at the Palais Garnier recently, Italian Laura Scozzi stressed the importance of trust and having a good relationship with each of her interpreters, and her pleasure in returning to restage her creation. 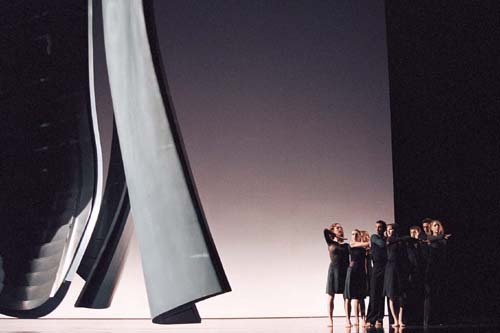 Belgian choreographer Michèle Noiret, and German dancer/choreographer, Susanne Linke, however, both voiced their nervousness and reservations about working with the dancers of the Paris Opéra Ballet. Reservations that proved to be not without foundation. Linke in particular said that it had been a shock to be invited to create a work for the French company as her way of working was so different. However, artistic director Brigitte Lefèvre said that she had been guided by the beauty and personality of each of the three choreographers. "I get tired of the words "classical dancers", she added, "because the Paris Opéra members are simply dancers who are particularly receptive to all styles. I have found that dancers who take part in modern choreographies dance the classics differently afterwards." But she added also that she was aware of the risk. Perhaps indeed it was because Noiret and Linke had felt so inhibited that the first two works on offer for this mixed programme were sad little affairs which were not so much non-dance as non-events. In both works there were moments of some sort of choreography, but particularly in Noiret's piece, Les Familiers du labyrinthe, the stage effects which the choreographer said were to show the passage of time, and which included great dangling, turning chunks of material in the air plus videos and simultaneous filming of the dancers in the wings projected onto the back of the stage, were allowed to dominate. The loud "spatialized' music by Todor Todoroff, composed at the same time as the steps, didn't add very much. It was hard to grasp what was going on, and most people left the theatre with the impression of having seen something dark, black, grey and murky, where movements set to banging noises oscillated between pumping arms in the air as if pulling old- fashioned lavatory chains, and quick, whip-lash movements of the hands resembling hamsters washing their whiskers. In Susanne Linke's Ich Bin , a piece about identity, Wilfried Romoli* looked very strange on stage in his underpants and socks in the midst of a battalion of fully dressed people who spent the best part of thirty minutes marching on and off. He looked even odder when he had his skirt on. There was some sort of build-up of tension, but why and what for? Both Noiret and Linke began works which led nowhere and were not fair on the dancers, the audience and themselves. When choreographers are invited to such a company it is presumably because they have something to give to their interpreters and will stretch them in some way as do choreographers like Mats Ek, Jiri Kylian and Pina Bausch. But the greatest mystery of the evening was how the great theatre, half empty for the first two works, suddenly filled up for Laura Scozzi's lively and entertaining vision of Kurt Weill's Seven Deadly Sins. 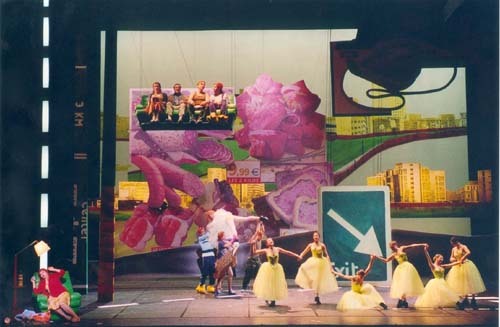 Successfully programmed in December 2001, the lyric ballet is a joyful satire on today's materialistic society. Scozzi knows how to bring out and use the differing personalities of her interpreters. Elisabeth Maurin as Anna II was absolutely irresistible and the work saved an otherwise quite miserable evening. But where did all the people there come from? Had word got around, and did spectators really pay eighty euros for just this one work? The production was directed by Edward Gardner. * Wilfried Romoli, aged 42, was given the rank of Etoile after the performance. Patricia Boccadoro writes on dance in Europe. She contributes to The Observer and Dancing Times and was dance consultant to the BBC Omnibus documentary on Rudolf Nureyev. Ms. Boccadoro is the dance editor for Culturekiosque.com.